www.FineDining.name is for Fine and Casual Dining Restaurants Names in Toronto and elsewhere! Your experience defines the art of Fine Dining, not the price you pay. Fine Dining Name™ is a Web site dedicated to Fine Dining and restaurants in Toronto and elsewhere. Fine dining represents a culinary art from the kitchen, cozy dining decor, appropriate selection of wines, beers and liquors. 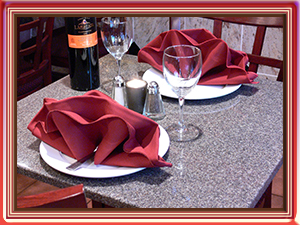 A friendly service should create a memorable fine dining experience. There are many restaurants in Toronto with price range on all levels that can create a fine dining experience fit just for you. 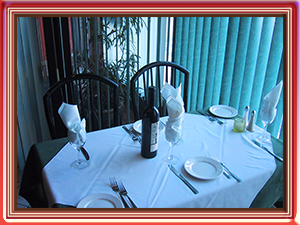 It is not the price you have to pay that guarantees you a fine dining experience. Fine Dining .Name™ is about your experience in Toronto restaurants that are affordable to your budget, rather than about fine dining etiquette in upscale restaurants. Restaurants' goers even with a limited budget should be able to experience the art of fine dining. There are two popular annual programs in Toronto that allow people to visit selected top restaurants and experience fine dining dishes for a fixed price. They are the very popular Winterlicious and Summerlicious. Just like with the beauty, the art of fine dining is in the eyes and on the palate of the beholder! Multicultural city like Toronto has hundreds of restaurants where chefs and cooks who prepare authentic dishes to satisy most discriminative patrons. We have seen a shift in cuisine availability from Continental to the Oriental one. A Wiener schnitzel on a plate is hard to find, but Sushi has become a mainstream food. Italian cuisine, Greek cuisine followed by French are the largest segments of Continental cuisine, although we should mention some other great foods of different European nationalities. Hungarian restaurants in Toronto are greatly missed. Some amenities can be an integral part of fine dining experience. Fine Dining Name® Web site will bring you information about them: Flowers, Bouquets and Gifts are not just for ladies in your life, but also close friends, business partners and clients. There is nothing like a Limo ride to and from a Fine Dining Restaurant, when you have a special occasion.